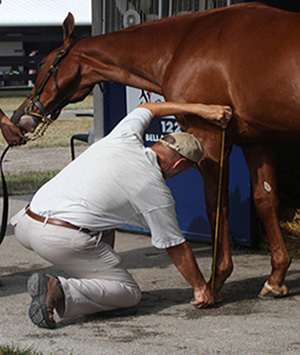 DataTrack is utilizing advanced technologies to refine the age-old art of hand-measuring horses in order to improve the consistancy of those techniques. The multiple physical measurements of racing prospects and bloodstock that we acquire are associated and analyzed through multiple computer programs to project a horse's potential racing and/or breeding capabilities using universally accepted growth curves. The results are logical projections about a Thoroughbred's form and likely function on the racetrack or in the breeding shed. 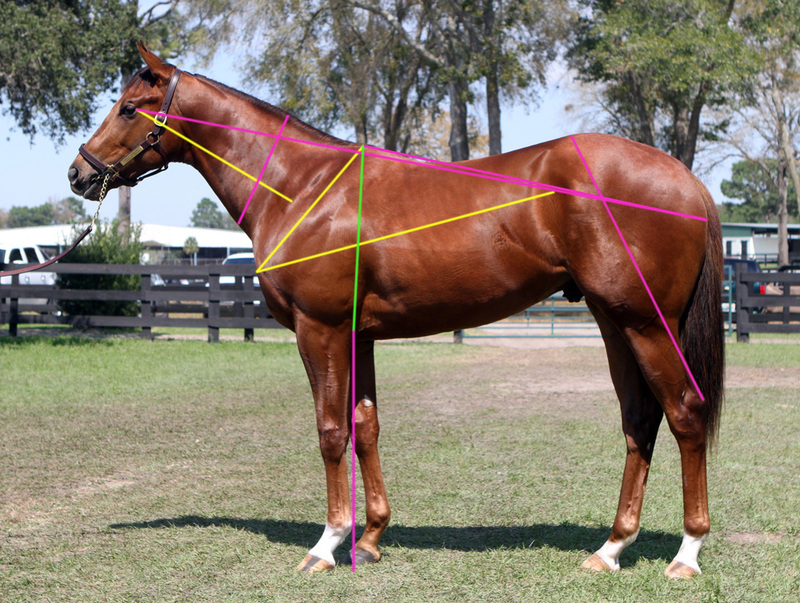 Biomechanical analysis for racing purposes is available for yearlings, 2-year-olds and older horses in training. 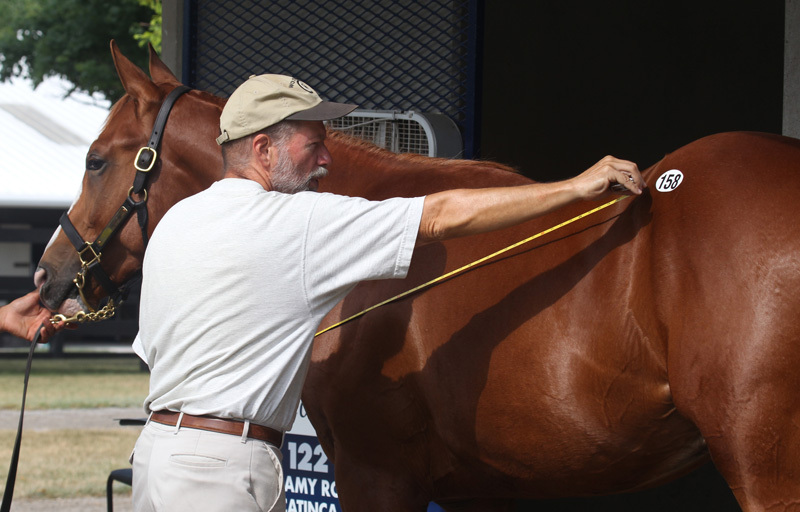 Breeding analysis for broodmare or stallion potential is available for yearlings, 2-year-olds and older horses in training, and recently retired racehorses. This colt could be considered somewhat marginal between a Good (B) or Very Good (B+) prospect, but we are giving him the benefit of the doubt... the only real matter of concern is that as a large individual he is a bit off the ground front and rear and a bit on the leg in the front, which in some horses can lead to climbing, especially if rushed too early in a race. That's one reason that his geometry is less than Very Good-along with the fact that his back is a bit short, which cuts down on his extension modestly. However, this colt is so well balanced in his other mechanics, and has what should be a good closing kick and solid Cardio Score that smart handling should enable him to reach his potential. He could be an absolute star on the grass. This colt went on to win a Grade II on the dirt and two Grade III races on the turf and placed in three other black-type events in his first 10 starts. Not all horses that are biomechanically analyzed by Data Track achieve this kind of success described above. After all, there are racing and training conditions, injuries, bad (and sometimes very good) luck, that go into a horse's racing career. In addition, sometimes horses just don't want to be racehorses. 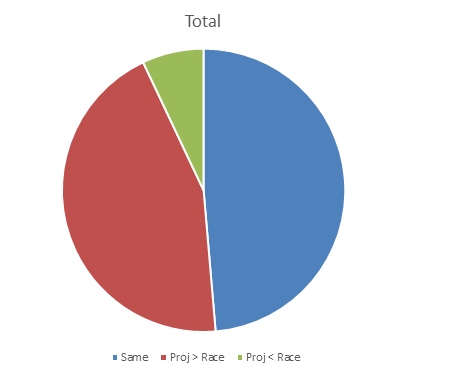 When one considers all of the various components that go into Data Track's biomechanical profile (as shown in the photo at the right), one would not be surprised that sometimes a C+ projection turns into a B race record. As the chart to the right shows, most of the time, our projections are on target. Click here to see how Data Track's Biomechanical Analysis and Cardio Scores can project actual racing performance for yearlings. Check out the results of 2-Year-Old Sales Black Type Horses with DataTrack Biomechanics here. To view the Biomechanical Projections vs Racing Results For Saratoga Select Yearlings From 2012 - 2015, click here. Check out Bob Fierro's Presentation on Biomechanics here.